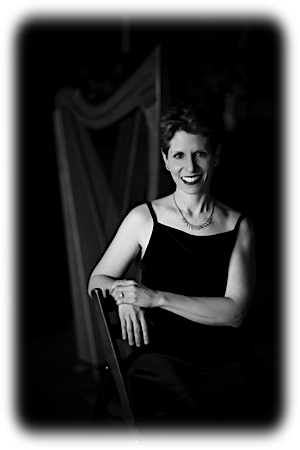 Harpist Anne Roos performed on the 2015 GRAMMY® Award Winning album, "Winds of Samsara" (Best New Age Album). She received WeddingWire’s Couple’s Choice Award® for the seventh year in a row. Her harp music flew around the world on United Airlines. Anne played for dignitaries, including the Lord Mayor of Dublin Ireland. Listen to her music on the National Public Radio (NPR) show, “How to Do Everything”, and see her TV performances on YouTube. Her performances at concerts, black tie events, school and university programs, wine-tastings, music festivals, and weddings number in the thousands. Anne Roos has played her eclectic mix of music on the Celtic harp for more than thirty years. Anne is comfortable playing the harp just about anywhere—on stage in front of large audiences and for small, intimate gatherings, such as house concerts. She performs with a finely crafted wooden harp, or a state-of-the-art lightweight, ten-pound carbon fiber harp, which can go places that no harp could go before. Anne Roos is a many-faceted performer who excels at playing a wide variety of music styles. Choose your music for your event, and Anne will deliver with the professionalism and musicianship that you expect. Anne’s ability to play a wide variety of music on the Celtic harp is what sets her apart from other musicians. Her playlist ranges from the expected—traditional Celtic, Early, Renaissance, folk, world and classical music—to the unexpected—modern popular music, including Broadway standards, movie themes, country, and Disney themes. Then there are the uber-unexpected tunes that often cause jaws to drop when Anne plays them: tunes by the Beatles, Metallica, Nirvana, Led Zeppelin, Sting, Lynyrd Skynyrd, and more. Her skilled renditions and flexibility make Anne a popular and much sought after musician for all types of events. She particularly enjoys the challenge of audience requests. • Are you planning an upcoming wedding or special event? Whether you are hosting a wedding, business event, school program, concert or festival, Anne will work with you to match your needs. She is even available for celebrity weddings and black tie events. Feel free to contact Anne’s booking representative, Ed Miller, at 530-525-5201. Or simply message Anne directly. • Have you always wanted to learn to play the harp? Anne offers Celtic harp lessons to anyone in the world via Skype, FaceTime, and Google Hangout. She also teaches in person, one-on-one, at several locations. Her music education includes theory courses at UCLA (where Anne earned a degree in Mathematics). Anne also taught music for the Los Angeles Unified School District. Even if you have never played an instrument or learned to read music, Anne can get you started. Many harpists know her as the author of “The Harper in Business”, a regular column appearing in the Folk Harp Journal, and Anne has the ability to teach advanced performance and musicianship skills, as well. • Do you want to attend one of Anne’s upcoming performances? Check out when Anne is on stage where you live--Visit her Upcoming Event Calendar. • Do you want to add Anne’s recordings to your music library? Anne’s 6 commercially available albums are unique—Several of them are packaged as little books with CDs tucked neatly inside a back pocket. Purchase CDs directly from Anne at her Facebook Merchandise Store or by calling 530-541-2575. Or shop from your favorite online retailers at amazon.com and CDBaby.com, and download tracks at iTunes. Also visit Amazon.com to download her collaboration with Ricky Kej and Wouter Kellerman on the GRAMMY® Award Winning album, “Winds of Samsara”. Anne even offers you a sample of her music—get a FREE mp3 download here on this website! Shortcut for Booking Agents, Managers, and Concert Promoters: For booking information, contact Anne’s booking representative, Ed Miller, at 530-525-5201. Anne will be happy to supply you with a complete performance resume, venue list, and links for music and video clips. Shortcut for Press Inquiries: Contact Anne’s booking representative, Ed Miller, at 530-525-5201, to schedule a press interview. Anne is an active member of The Recording Academy®, the American Society of Composers, Authors, and Publishers (ASCAP), and the American String Teacher's Association (ASTA).